Selfies are all the rage these days, but they're also proving to be a safety hazard. 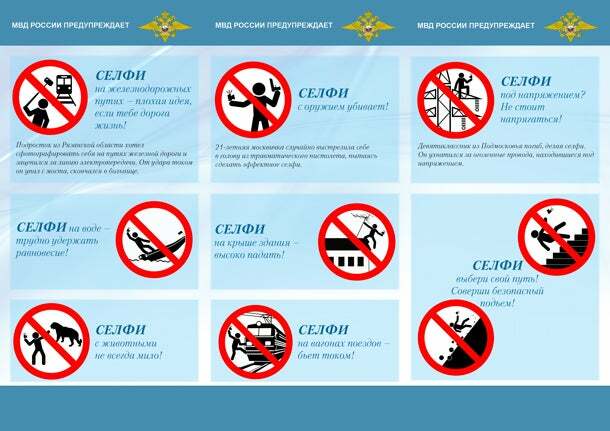 In light of several life-threatening selfie-related incidents in Russia – at least 10 deaths and 100 injuries over the last year, according to the Associated Press -- the Russian Interior Ministry and the country's police force has created a campaign called "Safe Selfies." This is perhaps the first time that the selfie itself has been deemed a safety risk. Selfie sticks, on the other hand, have been banned from a number of museums, attractions and events all over the world -- everywhere from the Palace of Versailles in Paris to the San Diego Convention Center on the eve of Comic-Con. 1. Selfie on railroad tracks is a bad idea if you cherish your life! A teenager wanted to take a picture of himself on tracks, but got electrocuted, fell off the bridge and died in a hospital. 2. Selfie with a weapon kills! A 21-year-old female accidentally shot herself in a head with a traumatic gun while trying to snap a spectacular selfie. 3. Selfie under voltage? It isn't worth it! A ninth grader died taking a selfie. He grabbed exposed voltage wires. 4. Selfie on the water, it's hard to keep the balance! 5. Selfie on the roof, it's far to fall. 6. Selfie with animals, not always cute! 7. Selfie on top of train cars electrocutes! 8. Selfie, choose your way! Perform a safe ascent!